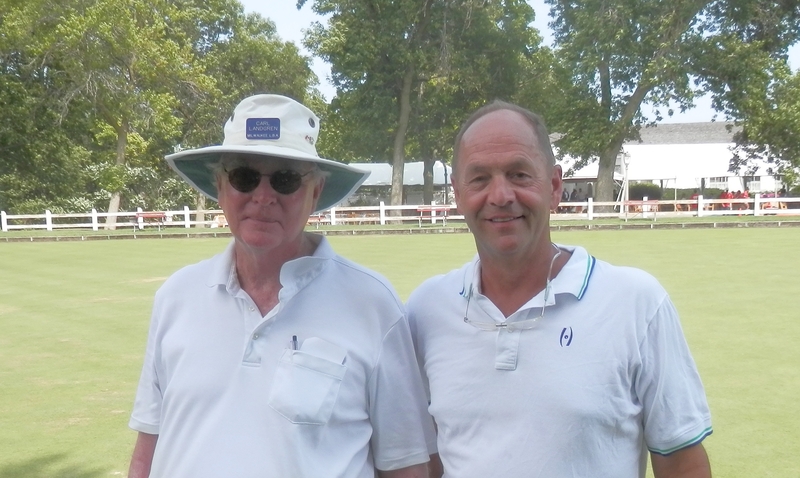 Gil Stephan started bowls in 1970 in Milwaukee and went on to win many Central Division tournaments as well as to have a major impact on the national and international scene. 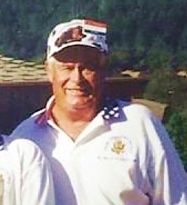 He was a long time co-chairman of the North American Challenge. He also ran many tournaments in the Central Division and at the Milwaukee Lake Park club. The Otto Hess tournaments he ran way back when they still consisted of 16 triples teams were legendary for their organization and their amenities. Gil will be missed by his many friends. R. GIL STEPHAN Jr. -Sun City (AZ) -2003 Nicknamed “Gillie” by his closest friends, Gil Stephan began his lawn bowling experience in April of 1970 as a member of the Milwaukee Lake Park LBC. 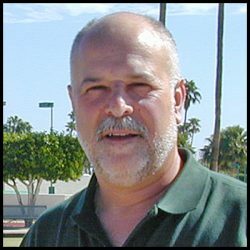 After moving to Arizona he was a South-Central Division Councilor to the American Lawn Bowls Association from 1990 to 1996. Gil was the President of the ALBA in 1997 and 1998 and the President of the South-Central Division in 1999 and 2000. 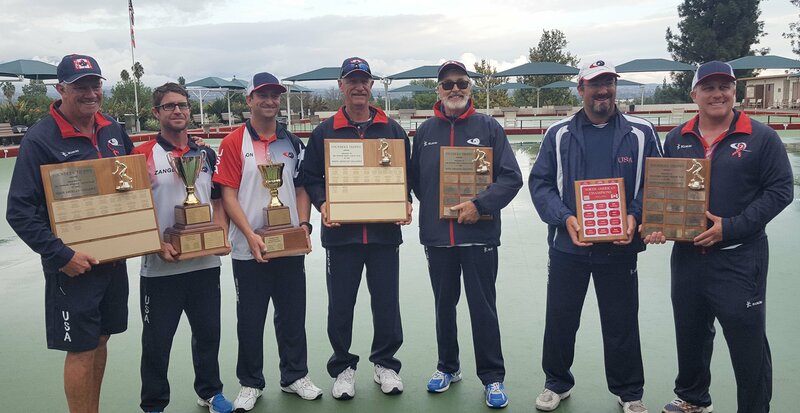 Again on the national scene, Gil chaired the National Open Tournament in 1993 and 1998; was National Tournament Director for eight years; a national umpire for over 16 years; and Chairman of the National Open Senior Tournament in 2000, 2001, and 2002. Gil has won more major tournaments than can be mentioned here. However, he is probably best known for his leadership as Team USA Manager. 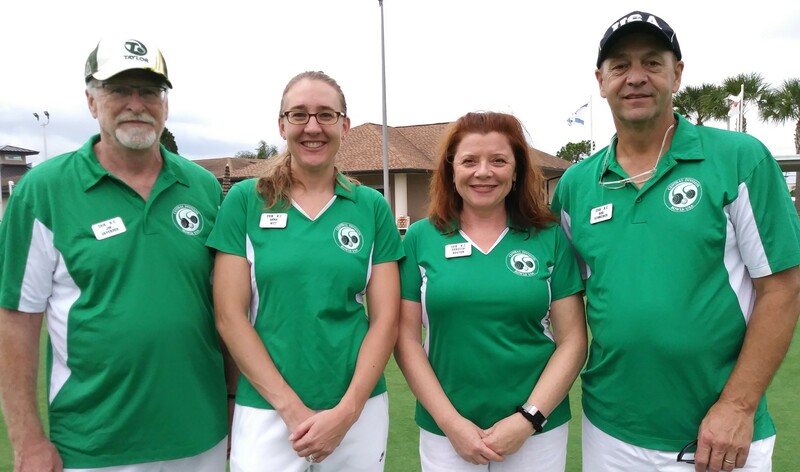 In 1995 and again in 1999 at the Asia Pacific Games and as Team USA Manager, Gil guided the team to finish high enough to qualify for the World Bowls Tournaments in 1996 and 2000. 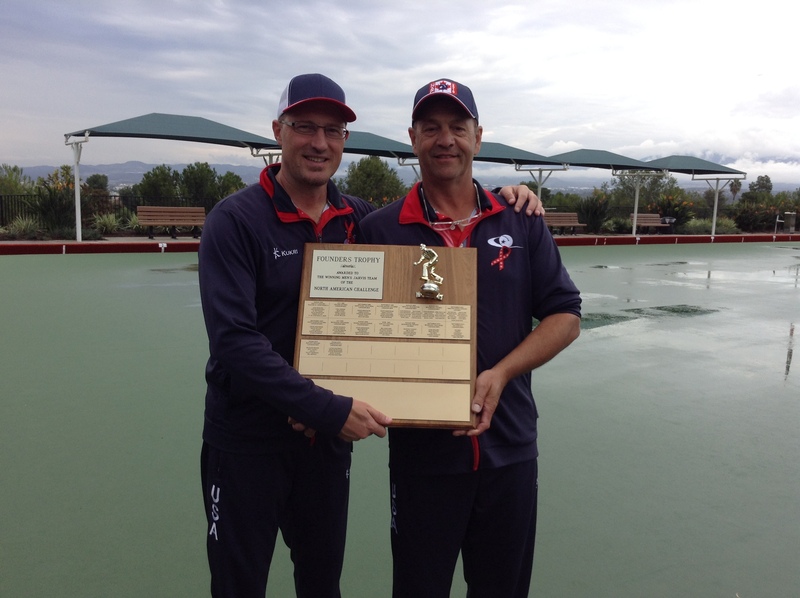 He was also the Team USA Manager at World Bowls in 2000 which led to team qualification for World Bowls 2004 . 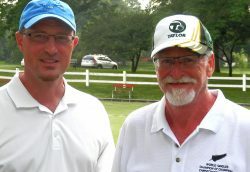 After his move to Arizona, Gil returned to Wisconsin every summer and continued his contributions to the Milwaukee club, where he was more than happy to pass his knowledge on to younger bowlers. The 2018 Nationals were uncharacteristically unproductive for the Central Division representatives. It started even before the tournament started with pairs skip Rob Behncke losing his balance while jumping from post to post on the beach and breaking his ankle only two days before the start of the event. Normally the second place team would then be the entrant. However, with such short notice, only Leif Andresen from the second place finishers was able to fill in. Leif arrived in Florida about 9PM before the start of games the next day to play with Jim Cavender. 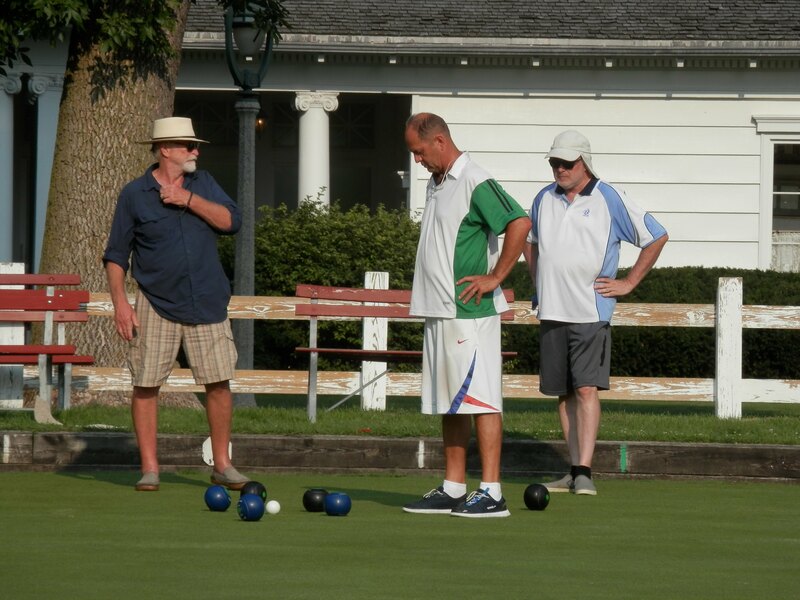 Despite Leif’s lack of practice, Jim & Leif were very competitive, highlighted by games against two of the teams which tied for first place that were determined by the last bowl. Also, the scurrilous accusations that Leif was somehow responsible for Rob’s broken ankle have no basis in fact. Rob’s brother has video proof. Rob was married a week after the tournament. Despite being hobbled by crutches, he managed to do a stand up job of it. 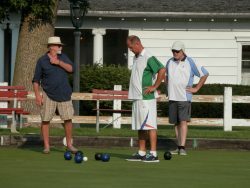 In the Men’s Singles, Bob Schneider was on track to finish in second place. He was ahead in the last end of his final game when his opponent trailed the jack in the ditch on his last bowl causing Bob to finish in fourth place. Anna Witt and Rebecca Nguyen were also very competitive but finished back in the pack. Jim, Leif, Anna, Rebecca, and Bob are all former National Champions, so I’m sure that better days are ahead as well as behind. 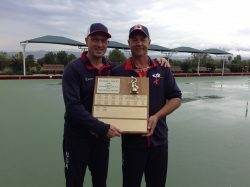 The best news from this event was the win of Steve Nelson in the Men’s Pairs. Steve is two or three years removed from the Central Division, but he is still one of us. Way to go Steve. Two Guys From Milwaukee, (no, not Dennis Morgan and Jack Carson…sorry, got stuck in the Way Back Machine there for a second), but rather Bob Schneider and Rob Behncke, were a large factor in the USA’s first ever victory over Canada in the North American Challenge. This international competition between the US and Canada was founded by long time Central Division, Milwaukee Lake Park, and Hall of Fame member R. Gil Stephan. Bob and Rob did a stalwart job in the pairs and fours. 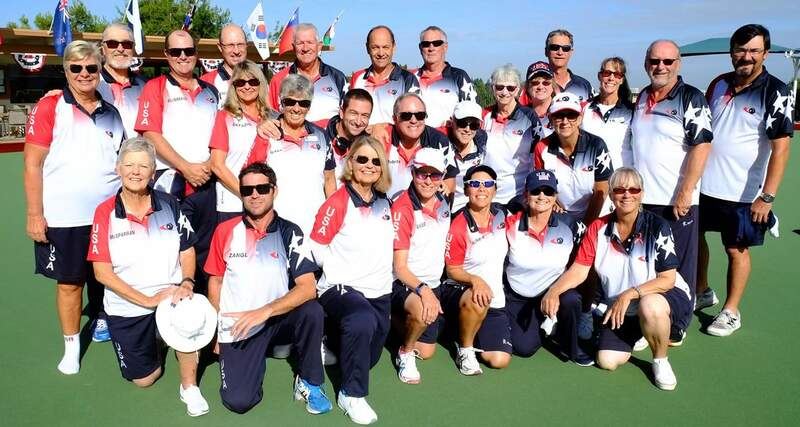 The US has won a division or two of this event over the years, but this time Team USA delivered the goods and won both the men’s and women’s sections, thereby capturing the overall title. It should also be noted that the team manager was a well known former Central Division guy, Steve Nelson. Congratulations and well done to all involved. 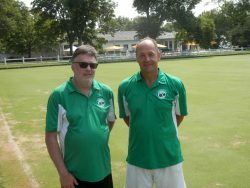 The team of Jim Grzybowski, Leif Andresen, and Randy Grzybowski won the Otto Hess tournament tournament for the second year in a row. This year the tournament director, Rob Behncke, introduced an interesting new format which he was introduced to at China Bowls. After some great competition, Jim, Leif, and Randy outpointed the second place finishers: Rob Behncke, Carl Landgren, and Olia Frolova. Coming up a few plus points short of second to finish in third place was the team of Tony Baer, Max Cavender, and Ken Koening. Schneider and Grzybowski size up the head while Cavender looks on in disgust after realizing there is not one single toucher in the bunch. 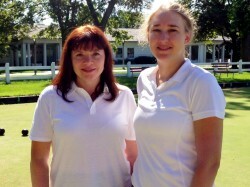 Thankfully both players stepped up their game and quickly recovered from this shoddy example of bowls. Good luck to all the Central Division players at the National Championships. Both Bob Schneider and Carl Landgren were undefeated going into the final game of the 2018 Central Singles. Bob went up early, but Carl fought his way back to narrow the margin. In the end, Bob’s steady play made the difference, and he won yet another Central Division championship. Carl Landgren finished second. Jim Cavender was third and Rob Behncke finished fourth.